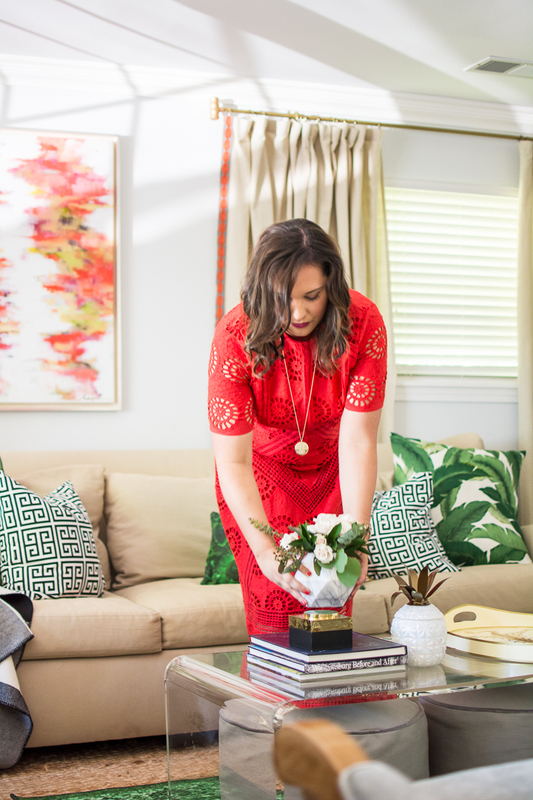 One Room Challenge Living Room Reveal! Oh baby, did we pull this one off by the skin of our teeth. I cannot explain to you how quickly the past six weeks have gone by. We had major fails (green chairs, say what?) and tons of successes (wait until you see the IKEA Billy bookcase hack), last minute decisions and amazing DIY's that somehow all managed to come together just minutes before the deadline. And, in the best news of the century, finishing the living room means that our entire interior renovation in finally complete! Not to sound like I'm giving an Oscar's speech but I couldn't have done it without my partner in crime, Amanda of Amanda Louise Interiors. Let's be honest, I tried to do it on my own and failed majorly, so I thank all of the things that she decided to work with me. Not many people want to cram months of work into a few weeks, go on road trips to find new fabric for chairs that have already been recovered once, listen to Mickey Mouse Clubhouse on repeat or spend 7 hour stretches in your home whipping up DIY projects for/with you. Looking back, I'm not sure that she realized she was signing up for all of that but she never let on that she was ready to run for the hills, even after that time I spilled hot coffee all over her car. 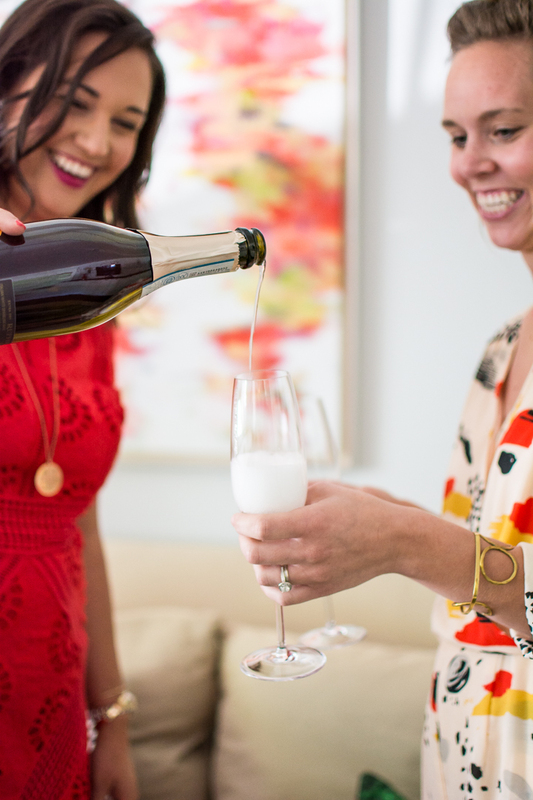 Cheers friend, you deserve it! I really am in love with the space - it feels so different yet still like home. Comfortable, chic, perfect for entertaining and, believe it or not, I think we did a spectacular job of finally making the pool table blend in to the room. You'll get two Before photos - one shot of how the house looked when we bought it and one shot of how we were living in it six short weeks ago because I was completely burned out from designing the rest of the house. We closed on the home just over a year ago so all of the changes have been made in the last 13 months or so. Can you believe it's the same space? 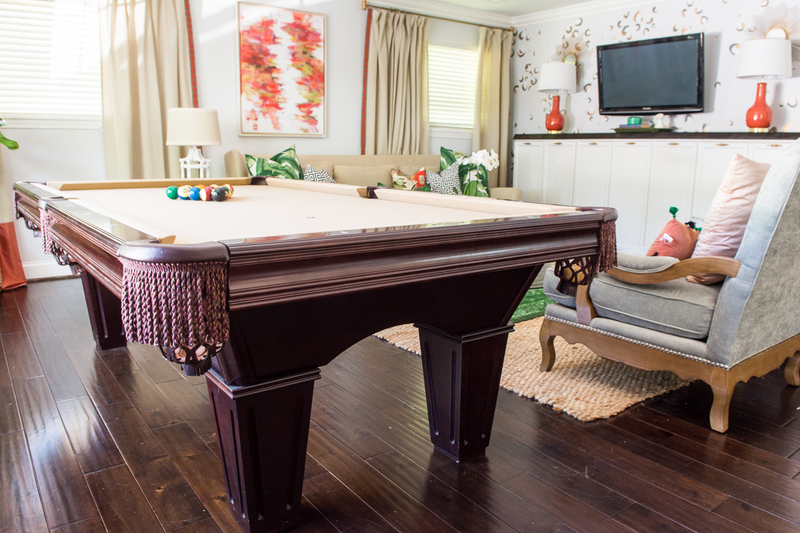 We used our all of our own large furniture pieces meaning we could play with the accessories - most of which we got for a steal! I'll link sources by photos but if I miss anything, let me know in the comments and I'll add it in! I'll be back soon to share all of the details of the IKEA Billy bookcase hack that TJ Breil whipped up for us because it deserves it's own post. The original art work in the space was painted by the insanely talented Marquin of Marquin Designs and framed in a stunning "floating" frame by Bennett's Frame and Art Gallery. We gave the IKEA curtain panels and Amazon curtain rods a major upgrade by adding hand crafted wooden bamboo finials by TJ Breil of Slab Woodworking to the rods and custom ribbon trim and silk bands to the panels. I love how they add a pop of color and draw the eye up to the ceiling. 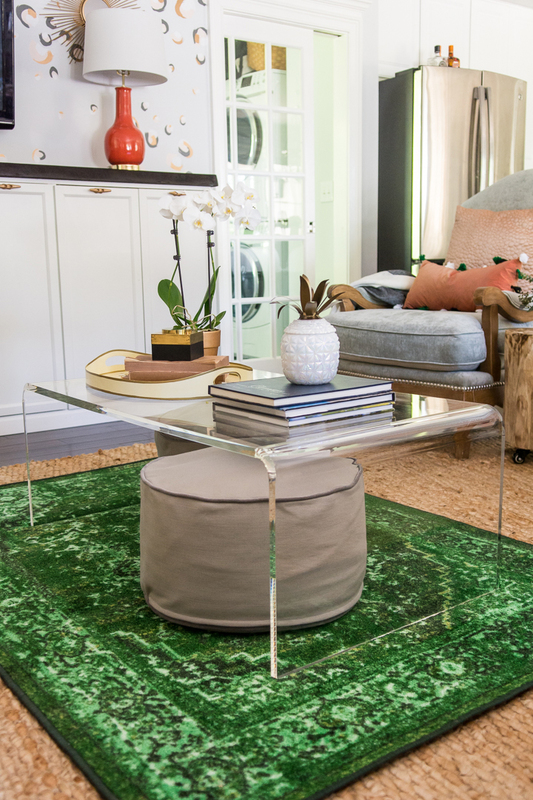 Because we do live with a wild animal/toddler baby, we, of course, built the room to be kid friendly - the acrylic Peekaboo CB2 Coffee Table was by far the best addition to the room. Everything wipes right off of it, there are no sharp edges and it's the perfect height to stash those poufs under. 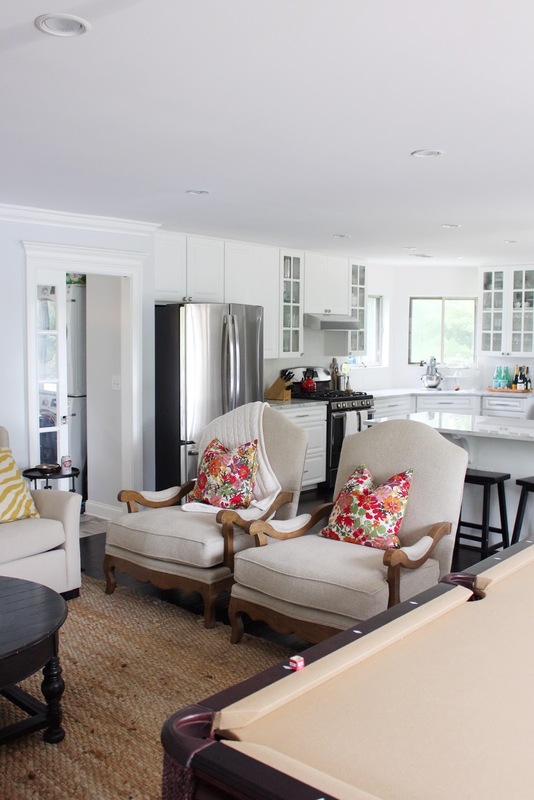 The poufs pull out to be toddler seating for Gray and his friends or to be footrests for Justin when he naps in the chairs watches golf. The IKEA Billy Bookcase hack by TJ is just so stunning. 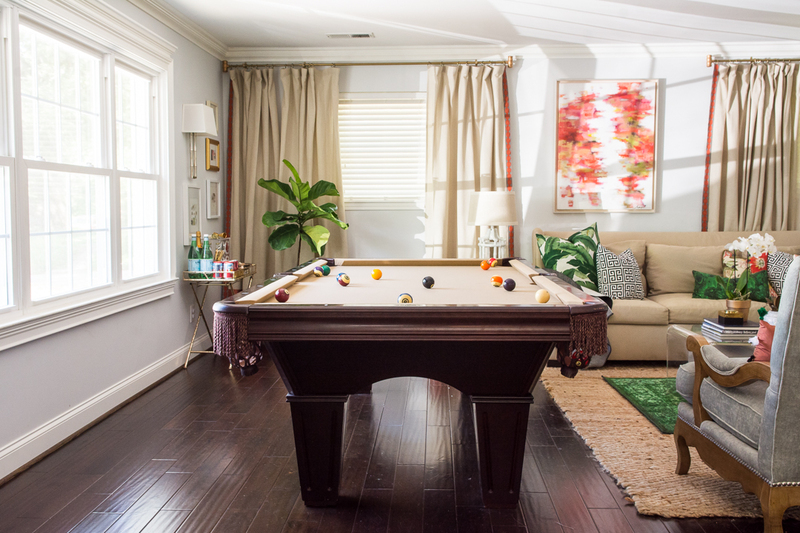 TJ handcrafted a custom raw edge wood top that he hand died to match the wood of the floors and pool table - Justin's two favorite elements in the space. In a nod to my legacy as a Captain's daughter we used actual dock cleats (painted gold) as the pulls on the cabinet. 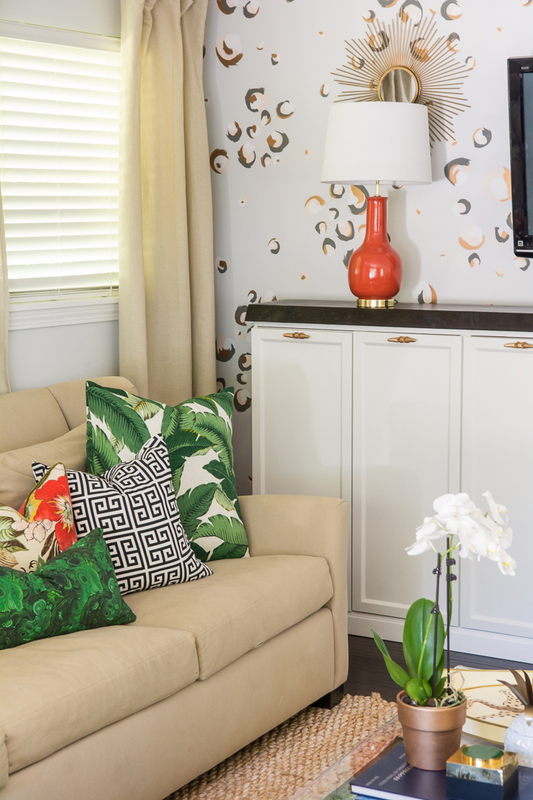 Our TV is mounted on a swivel wall mount that pulls away from the wall and turns at nerve wracking angles - which means we can position the TV to work for all activities in the room. And the room would be nothing without that hand painted feature wall. Andrea Sabugo brought my vision to life - metallic animal print was a wildcard but I am just so happy with it. 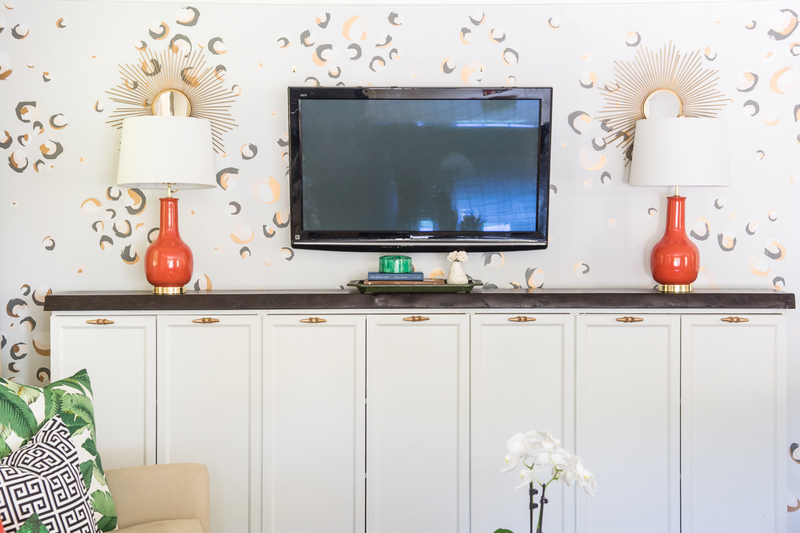 We chose wide brush strokes in shades of blush, charcoal, light gray and pops of metallic gold to accent the wall color and I couldn't love it more. Our arm chairs got a make-over (or two) in a gorgeous shade of seafoamy-grey (that's a real color) and custom silver nail heads. We purchased the emerald green rug exactly 4 days before photo day after both Amanda and I admitted we had been secretly shopping for a pop of emerald to bring into the room. 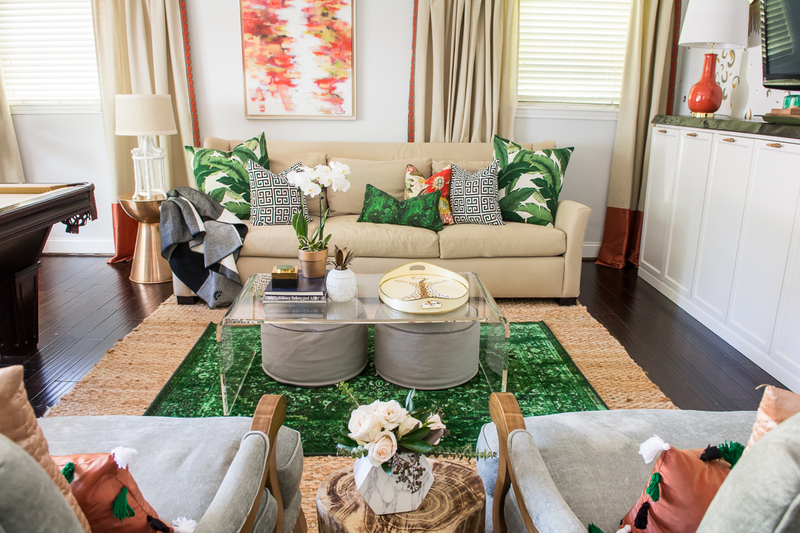 The Greek key, malachite, palm and tassel pillows were all handmade for the space by my go to fancy linens creator, Elizabeth of Wheaton Whaley Designs. She was so thoughtful with all of the details - she hand made each of the tassels on the silk lumbar pillows and surprised me with an emerald zipper in the black and white Greek key covers! Oh that pool table. What a labor of love she was to design around. 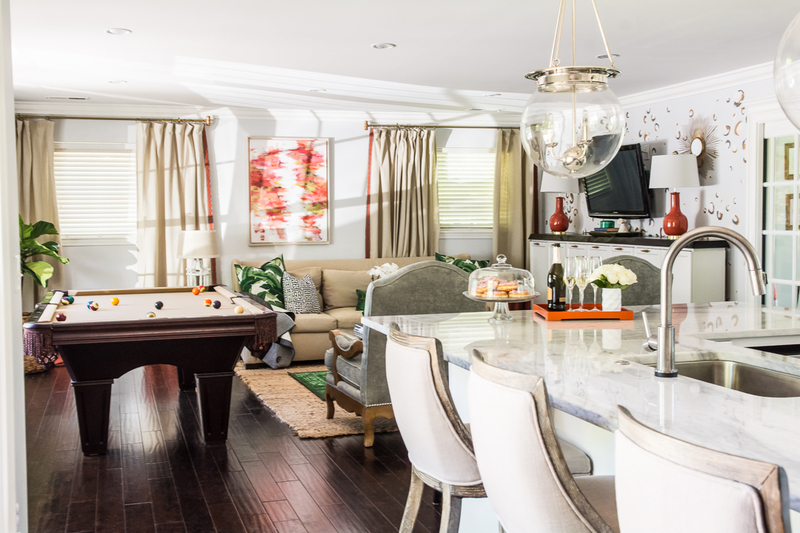 After our move into this house, we had the table re-felted in a gorgeous camel color (it was pool hall green in our previous two houses), which made things a lot easier on us when designing this room. 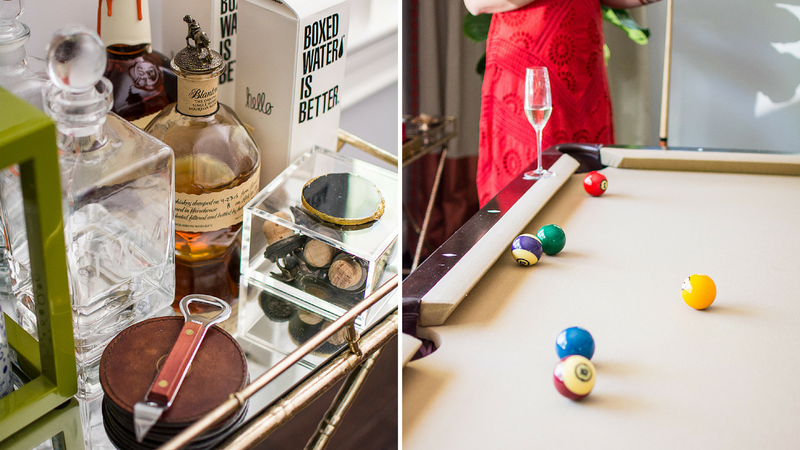 My absolute favorite detail in the room has to be the His and Hers bar tables. Because we aren't insane, the tables (from Hobby Lobby) actually fold flat and stow in the space between the IKEA Billy and the wall, out of the way of grabby toddler hands. We do entertain a ton so I wanted the option to have all of our bar ware out for ease but not on a permanent basis. I floated the idea past Amanda and not only did she love it but the decision helped us finish up the decor flanking the large picture windows. Beside each of the bar trays is a framed photo from our wedding day, a drawing by Ink and Bobbin of our prior two homes and a framed sketch from one of our trips abroad. Behind the "Hers" tray is a framed sketch of my Instagram feed by Sophie and Lili and behind the "His" tray is a sketch of Justin's favorite bar from his college days. And, that's a wrap! What do you think? Did we pull off our whole "Stephanie gets outside of her grey and white comfort zone but doesn't give herself anxiety with too much crazy" vibe? 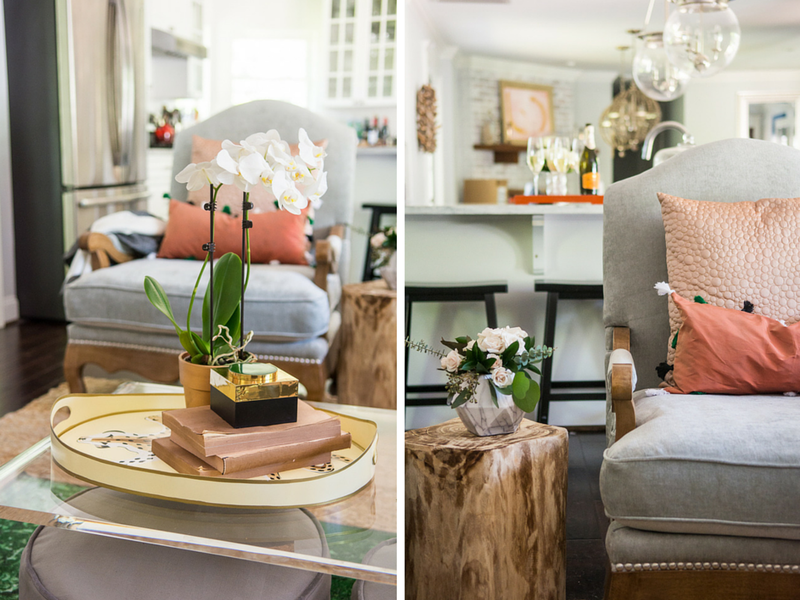 Thank you so much to Linda from Calling It Home for hosting the One Room Challenge - I've been peeking at all of the reveal that have gone live over the last 24 hours and the spaces are simply stunning. 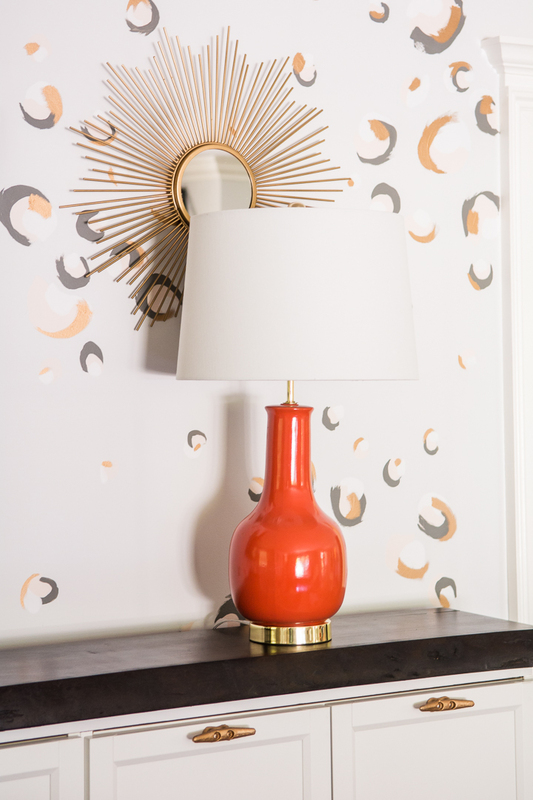 Be sure to head to the link up and check out my fellow decorators. For more of our renovation, including our kitchen that has been featured on TODAY.com and Apartment Therapy, click here. I am seriously blown away by how amazing this looks!! You did so good! Can I talk you into doing my house now?! Haha! thank you!! it was for sure a team effort and we are worn out but it was worth it! Twins, love, yours is drool worthy, xo. 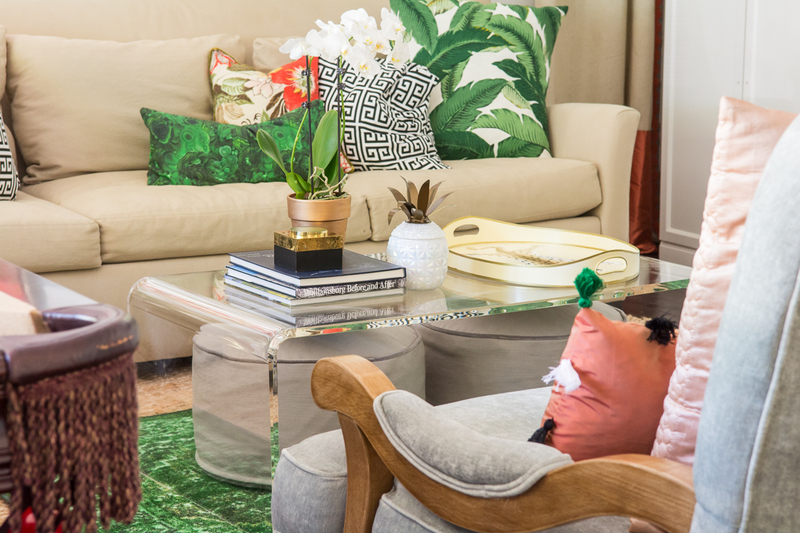 Ok, I thought your house was gorgeous before but holy moly this room is STUNNING! Moving the TV to the other wall makes the entire room look completely different. Y'all did a fabulous job! The crazy thing is that I could never imagine a different lay out - and then we moved it all around and I thought "why didn't I have it this way from the get go!?" All I needed was a fresh set of (professional) eyes! It really is amazing what a simple switch of furniture can do to a room!! Although it's not my style, it's a stunning room! Thank you! I'm loving the change! It looks amazing!! Love the vibrant colors and patterns! Nice job lady! Oh you will love her!! She does amazing work! Yeah, the wheels are thankfully hindered by the super thick jute but I def considered the (more expensive) West Elm option bc it is sans wheels! Let's do drinks soon! Ohhhhhh Stephanie! I die! This space is so swoonworthy and completely ties into your kitchen and dining room in such a perfect way. I seriously think the hand-painted wall is my favorite touch. It sounded so wild and crazy, but it came together with every so beautifully. Yep... I'm coming over. Changing the TV wall makes soooo much sense, and love that your mount allows you to swivel the view into the kitchen. I don't know about you, but I need my Netflix while cooking. The room is totally stunning and makes me wonder if green is the new black. Thank you so much for sharing! Thrilled to have found your blog during the ORC, I'll definitely be keeping up now that the challenge is over. Steph, this is gorgeous! LOVE it! The curtains make the windows look SO much bigger and more imposing. And the pops of green? Just love. I know you guys must be so thrilled with how it turned out! Gorgeous!! 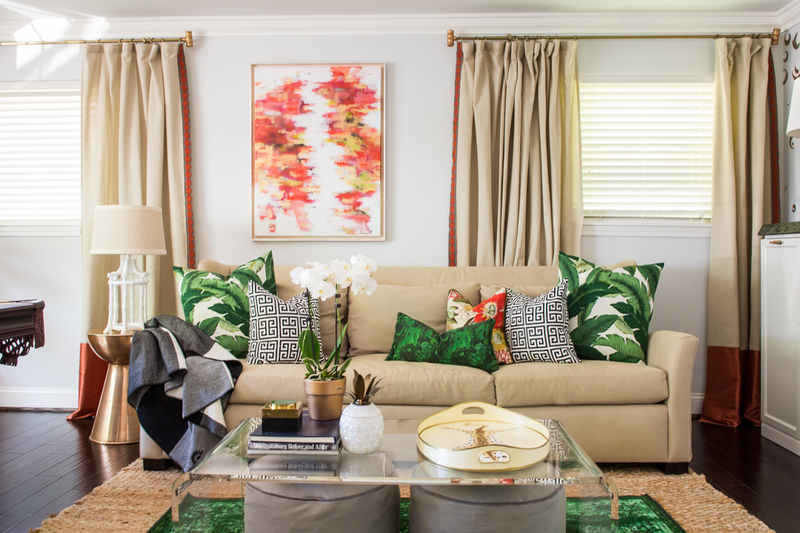 Such a bold mix of patterns and colors, I'm so impressed! :) Love the new layout too! Wow...wow...wow!!! What an amazing transformation!!!! 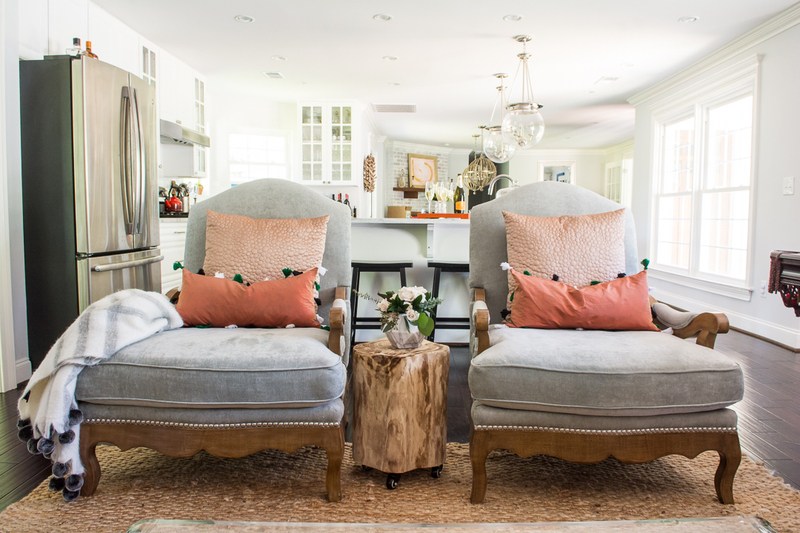 Do you mind sharing where you found the seafoamy-grey fabric for the chairs? Holy.Amazing. 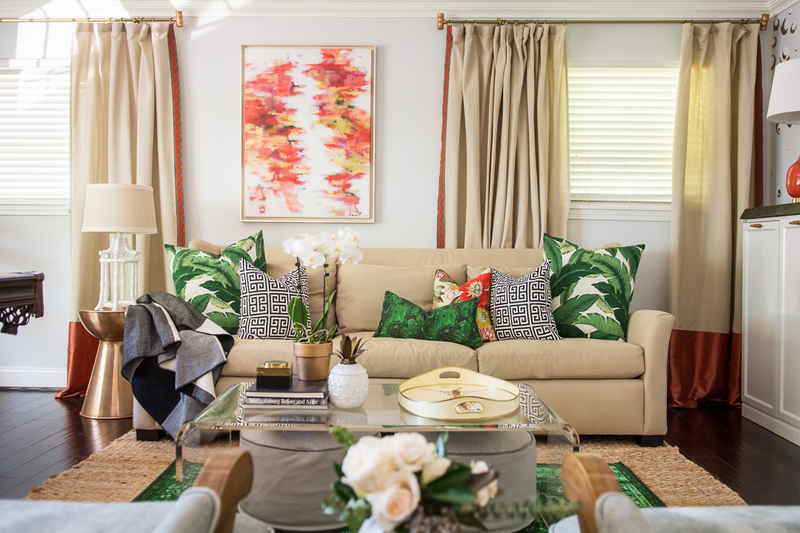 You're making me rethink the neutral of my house! LOVE. Looks amazing. I am OBSESSED!! Such a perfect mix of modern and classic. 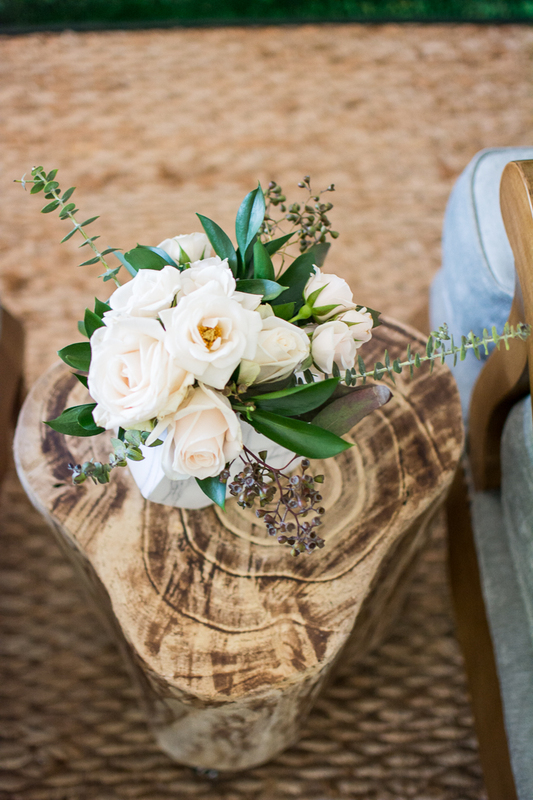 Timeless and so chic! 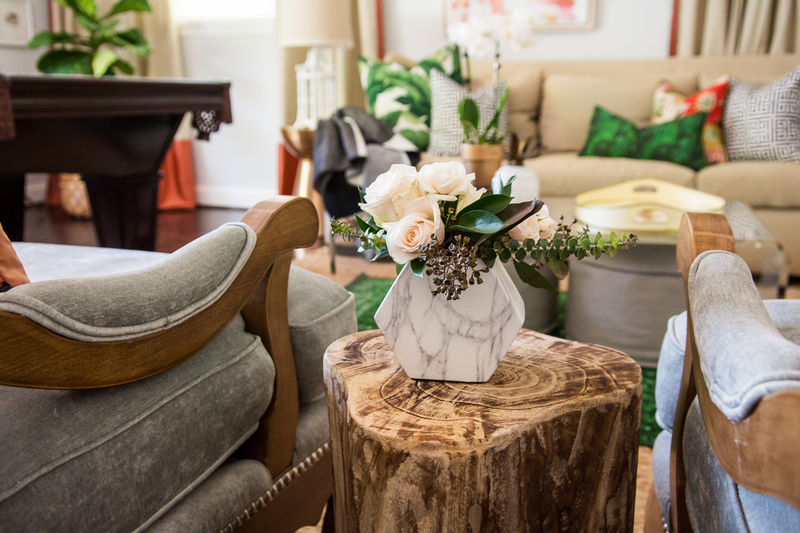 And that vase is hobby lobby? Shut up! It looks SO GOOD. The TV wall is everything. EVERYTHING. All the applause and job well done's! I love how it all came together! So beautiful! Love! It came out so pretty and that wallpaper is everything! Great job! This transformation is unbelievable! I love the color choices. Great job! It looks so good!!! We're still in the chaos stage of our den redo, and I'm just so ready for it to be finished! I love how colorful it is! 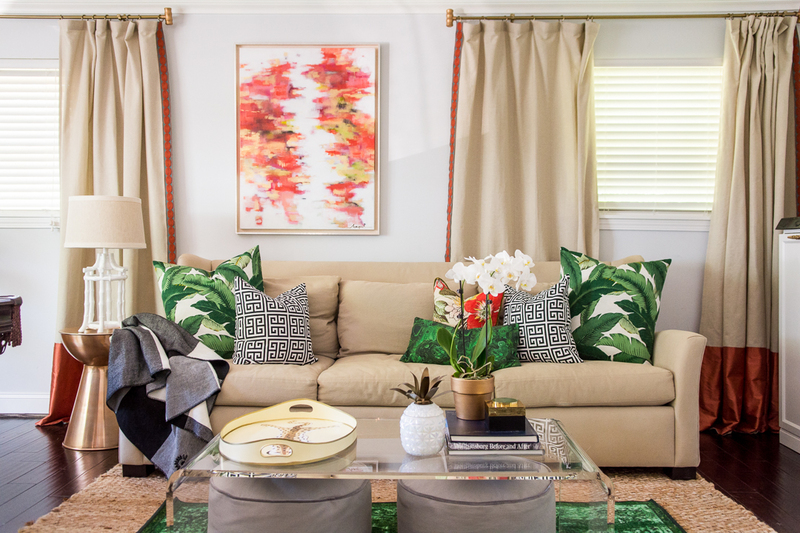 Especially since the most intense color is on rugs and pillows, but the furniture and accent wall are neutral so if you ever wanted to switch to another color you could cheaply and easily. I finally got the chance to sit down and take this all in. Thank you for including the before pictures!!! Wow. It was so ugly before, haha! I really love what you did with it. 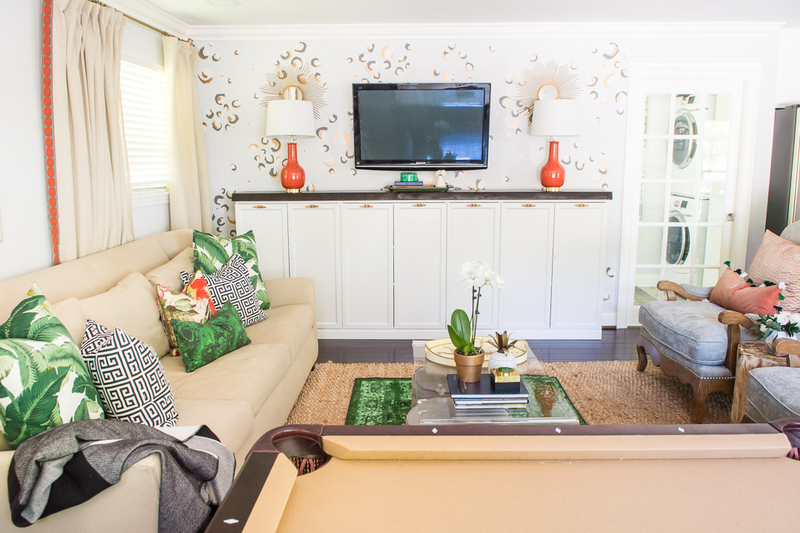 The couch and the hand painted wall. OMG. Death. This really gives me hope in my current house hunting process. A lot of places we're looking at look like your before pictures and I'm like "whyyy is everything ugly?!?!" The wood paneled walls is HUGE here in Hawaii and I am just like, gag me please. Who wants that?? While I won't have the budget or time to renovate as extensively as you are, I at least hope to make a space half as beautiful as this. You're definitely inspiring me!! Totally love it, Stephanie! Oh my eyes! Now I have to come visit you on the other end of the US but I am not certain I will ever want to leave this room! 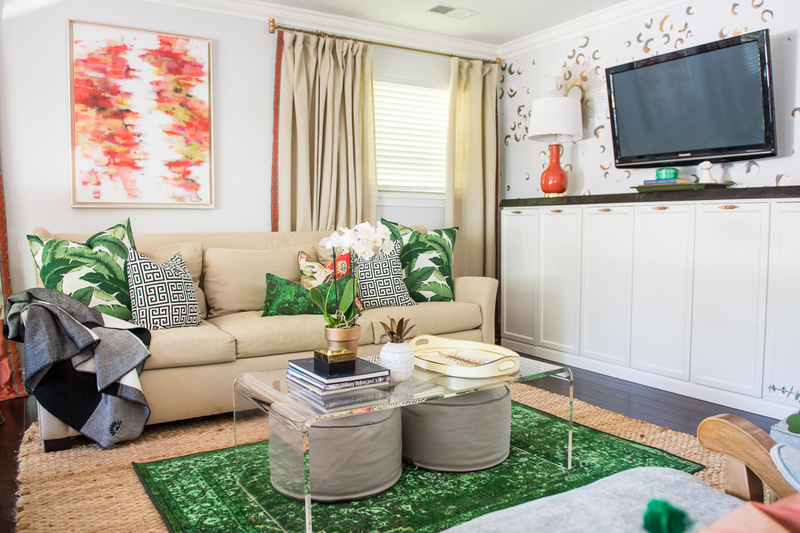 Love so many elements - especially that you moved the TV and that gorgeous hand painted wall. Swoon!!! wow WHAT a change! 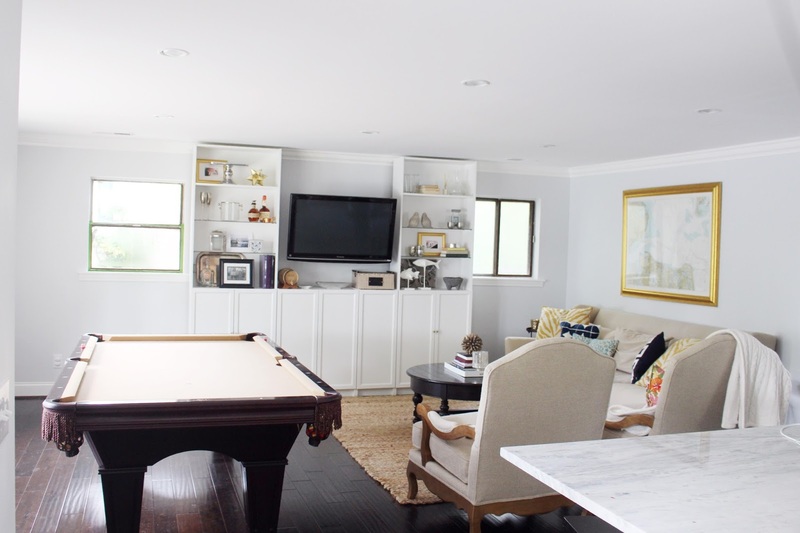 before the makeover, was your tv housed in built-ins or is that a piece of furniture? we have a little inset wall in our living room where i'd like to do something like that.